The United States Congress designated the Blackridge Wilderness (map) in 2009 and it now has a total of 13,107 acres. All of this wilderness is located in Utah and is managed by the Bureau of Land Management. 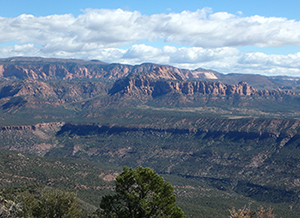 The Blackridge Wilderness is bordered by the Zion Wilderness to the northeast. Blackridge Wilderness is a logical extension of the Zion Wilderness along with Red Butte, LaVerkin Creek, Taylor Creek, and Beartrap Canyon Wildernesses. It is part of the integrated watershed, wildlife habitat, and scenic terrain of Zion National Park, and is among the most pristine, spectacular, and ecologically significant BLM-administered wild land in Utah. Blackridge is the largest of the six extensions of the Zion Wilderness. This area is composed of rugged sedimentary cliffs formed among the Grand Staircase plateaus. The canyons in this unit have cut up to 1,000-foot-deep sheer walls of red Navajo Sandstone capped by the Carmel Formation. The rugged topography of this unit makes it an important scenic viewpoint. Black Ridge, formed by the Hurricane Fault, is a major geologic feature and provides outstanding views into Zion National Park, over into Canaan Mountain, and west to the Pine Valley Mountains. The upper elevations and north- and east-facing slopes are populated with ponderosa pine, Douglas fir, white fir, aspen, and Rocky Mountain juniper. The middle elevations are predominately shrub woodlands supporting oak, pygmy pinyon-juniper, yucca, serviceberry, littleleaf mountain mahogany, and princess plume. Below 4,500 feet is the American Desert zone with blackbrush, salt bush, and creosote bush, which are adapted to drier conditions. Riparian habitat also occurs along streambeds, and hanging gardens grow in seeps and drips on canyon walls. Maidenhair fern, pink-flowered shooting star, and scarlet monkeyflower inhabit these verdant areas. Elevations in this wilderness range from approximately 3,650 to 6,550 feet. Mountain lions prey on the deer throughout the area and in places are relatively numerous. Seven different species of raptors inhabit the area and often nest in the steep cliff walls. These include the bald eagle, peregrine falcon, golden eagle, prairie falcon, American kestrel, red-tailed hawk, and Cooper's hawk. Peregrine falcons use much of the area and bald eagles are known to winter in the Virgin River drainage south of the WSAs. Hiking and backpacking are outstanding in this unit. Summer temperatures often exceed 100 degrees Fahrenheit with temperatures in excess of 90 at higher elevations and day and night temperatures differing by over 30 degrees. Winters are cold and often wet with temperatures ranging from highs of 50oF to 60oF during the day to well below freezing at night. Blackridge Wilderness receives 14 to 18 inches of precipitation each year. There are no maintained trails in the Wilderness. Planning to Visit the Blackridge Wilderness? How to follow the seven standard Leave No Trace principles differs in different parts of the country (desert vs. Rocky Mountains). Click on any of the principles listed below to learn more about how they apply in the Blackridge Wilderness.